Newdrives offers a wide range of options and solutions to meet the most demanding design criteria. We will offer assistance to help create a truly unique driveway or patio to enhance the appearance of your home, whatever its age, style, or setting. We pride ourselves on understanding our customers individual needs, from initial contact right through to completion. 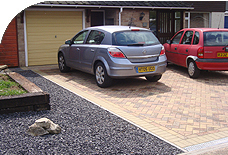 Block paving is by far the most popular surface for a driveway or patio. The wide range of blocks colours and laying patterns allows you to create a unique design to enhance your home. 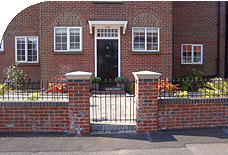 There are both 'antique' and 'modern' blocks available to suit your property. Clay paving offers vibrant long-lasting colour; whilst concrete gives a more subtle shade. Various kerbs and edgings along with circular patterns provide the finishing touches and endless design possibilities. 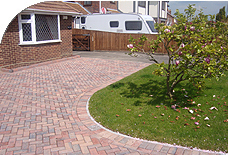 It is vital that block paving is constructed and laid correctly. Many problems arise with incorrect installation. 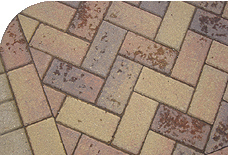 Permeable paving is also available. 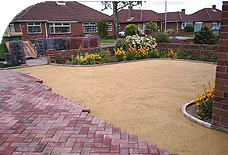 All types of block paving can be viewed on our portfolio page. The base must be at least 100-150mm deep, consisting of MOT 'Type 1' granular material (laid on a 'terram' membrane to stabilise ground and suppress weeds). The sub-base must then be consolidated with a heavy vibrating roller to prevent sinkage. A firm edge restraint is to be laid and haunched with concrete, to prevent movement of blocks and loss of sand. It is vital that the preparation work is carried out to a high standard. 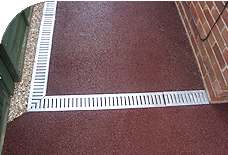 Drainage is very important and is often ignored because it can be difficult to install and adds cost. As a professional driveway installer we will take this into account and advise you accordingly. You do not want to be left with puddles or flooding when it rains! Newdrives hold a certificate in 'Sustainable Urban Drainage Systems'. 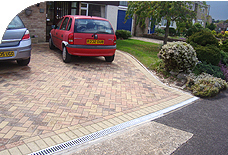 Following the introduction of new legislation in October 2008, you can no longer pave over your garden or existing driveway without considering where the surface water may drain to.Newdrives can offer guidance on this in relation to your property. Paving is laid on a compacted laying course of sharp sand (screed as it is known in the trade) approximately 25-30mm deep. This is levelled out using screeding rails and lines. Depending on the choice of paving, the pavers are laid either randomly using different sizes, or as is most commonly seen, a herringbone pattern with a soldier course or stretcher bond around the perimeter edge. Blocks are cut precisely using a disc cutter with a diamond tipped blade to infill where necessary. 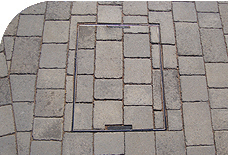 Where a recessed manhole cover and tray has been installed, blocks are then laid and cut to match the existing pattern. 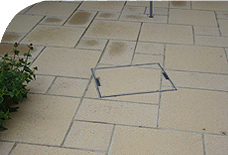 Kiln dried sand is swept onto the paving and vibrated into the joints with a compaction plate. This process ensures paving is levelled and the filling of the joints assists with the locking effect created by the paving pattern, thus allowing for vehicle and pedestrian traffic. After removing all surplus sand, a stabilising solution is applied to the entire area of paving. This will ensure the sand is not washed or blown away during the early stages following completion. A binder course (base coat) with a surface course (wearing course) laid on top. 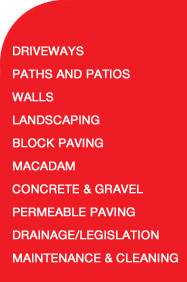 The thickness of each layer is determined by its application, whether it be a road or domestic driveway. This offers a low cost alternative but with limitations. 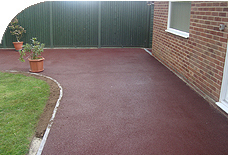 Various sizes of aggregate and a wide range of colours and textures are available. This is an economical, quick and easy option to use, once you have constructed a sub-base with an edge restraint. One of the disadvantages is that it seems to end up in the house, in the car and just about everywhere else (and is very noisy in the morning when the milkman delivers your daily pinta!). We offer a wide range of services to suit our clients, including slab laying, fencing, brick wall construction, lighting and turf laying. This will enable you to employ one contractor to carry out the whole project with total piece of mind. 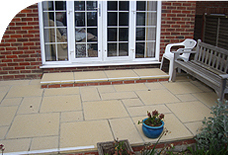 Newdrives offers a wide range of stylish patios to suit your requirements. A patio in the front or rear of your property can be seen as an 'extension' to your living space and can be constructed using a wide range of materials and in numerous stunning designs.Natural stone, granite and blockpaving are to name but a few.Please view our portfolio for ideas. On confirmation of your order (which we would prefer in writing) commencement dates will then be discussed. The schedule may be delayed due to weather conditions or difficulty arising with availability of materials. In these unusual circumstances we aim to inform you as soon as we can. No deposit or interim payments are required! Once the work is completed and you are totally satisfied, we will ask for payment in full on receipt of the written invoice (this also acts as your guarantee). The work will be carried out to the highest standards and the site will be left clean and tidy with all rubbish removed. The driveway or patio will exceed your expectations. In the unlikely event of an accident, Newdrives has a minimum £5 million pound policy to cover every eventuality. A small amount of cleaning is necessary to keep your new driveway/patio in 'tipp topp' condition. Sweeping up any dirt/soil/weeds/moss/leaves and spillages will help keep the area clean and tidy. The use of weedkiller 2-3 times a year will also help. 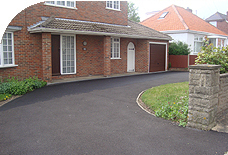 If a more thorough clean is required Newdrives offers a service enabling your driveway to be proffessionally 'jet washed' using a high pressure washer and any sand lost during this procedure replaced. Stabilizing solution is then applied. Various sealants are on the market and advice can be given as to where and when to use them. 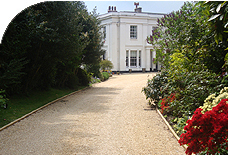 For further peace of mind, Newdrives has also been vetted by Hampshire County Council to ensure we offer a high standard of workmanship with continual attention to detail. The ‘Buy with Confidence Scheme’ can be seen in more detail by visiting their website. 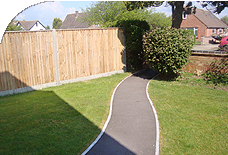 We have also carried out work for local schools and colleges. Examples of our work can be viewed in our portfolio, or enclosed with your quotation. As a Buy With Confidence member, we have been independently assessed and approved by Hampshire Trading Standards. Membership of the Buy With Confidence scheme gives our customers great peace of mind, safe in the knowledge that we are committed to trading legally and fairly. We are Brett and Marshalls Approved Installers so you can be reassured by the quality of the products we use, as supported by their respective 10 year guarantees. What is more, should you have any reason to complain about the quality of the work we have undertaken, please contact us at the earliest opportunity and we will endeavour to assist you with a view to maintaining the excellent customer satisfaction we pride ourselves on, as well as fulfilling all our obligations under The Consumer Rights Act 2015. Last but by no means least, our Buy With Confidence membership means that, like us, our customers can receive free legal advice and support from Trading Standards experts, in the unlikely event of any dispute.